More sensitive data is passing through or residing on enterprise mobile devices than ever before. While IT leaders recognize the need to secure their devices, for many it’s an ongoing challenge. Several considerations unique to the mobile environment must be thoroughly considered. 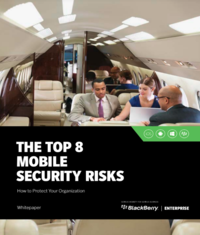 Download this white paper from BlackBerry to learn the top 8 enterprise mobile security issues and a worksheet for how to protect your organization.